There is beauty in science...from the prismatic effects that form rainbows to the rainbow of colors in a peacock's tail. 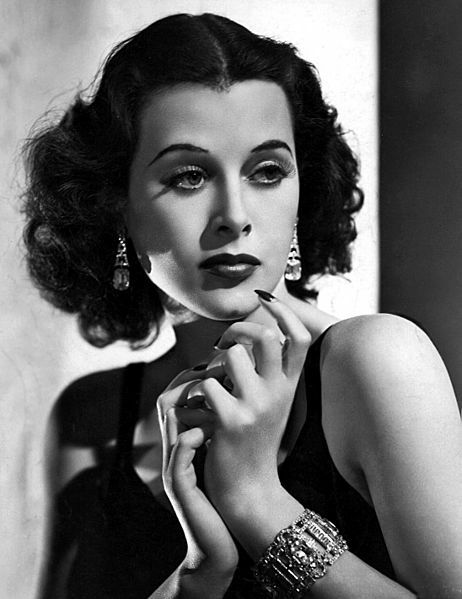 But there is also beauty in citizen science, as in the case of classic Hollywood Bombshell and pioneering inventor Hedy Lamarr. As a woman born nearly a century ago (November, 1913) it is time to celebrate some of her many accomplishments. You can also read more about all these in Richard Rhodes' recent book, "Hedy's Folly: The Life and Breakthrough Inventions of Hedy Lamarr, the Most Beautiful Woman in the World. Born in Austria as the daughter of a successful banker, he would teach young Hedy not just about banking but also all the other wonders of the world. Much of this occurred during their frequent long walks through the Vienna Woods. "Whenever they went together, he explained to her how everything worked - 'from printing presses to streetcars' she said. Her father's enthusiasm for technology links her lifelong interest in invention with cherished memories of her favorite parent." She also learned much from her first husband, rich industrialist Fritz Mandl. As an important munitions provider to both Mussolini and the Axis powers in the run-up to World War II, he would hold frequent parties with high-ranking military commanders and casually discuss recent developments in weapons technology. While the men would talk freely Hedy would take careful notes in her head; the men just saw a pretty face but inside she understood all they discussed. She was then able to use that knowledge when she left the marriage and came to America in the mid-1930s. In many ways her looks were both a blessing and a curse. They certainly helped her forge an exciting film career at the age of 19, receiving positive reviews in Europe which allowed her to start a new career with MGM once in America. Since the movies she acted in only required a total of 2-3 to produce, it provided her money and free time to support herself independently and gave her freedom to engage her scientific interests. But her looks also held her back. It was tough to get her ideas recognized and have people take chances on her inventions. "It also annoyed her deeply...that few people saw beyond beauty to her intelligence. 'Any girl can be glamorous,' she famously and acidly said, 'All you have to do is stand still and look stupid.'" For many of these reasons her own accomplishments have been called into doubt. For years even those people who recognized the importance of her inventions didn't give credit to her scientific capacity. Instead they chalked it up to her skills at eavesdropping and copying the plans overheard during her life with Mandl. But that belittles her own accomplishments. After all, it's one thing to hear about a potential invention and a whole different thing to actual reduce it to practice. In fact that's the essence of our patent system...it doesn't count to have a basic idea you also have to make it work. Looking back the Austrians and the Germans didn't reduce any of these inventions to practice. They even had the benefit of large teams of scientists working on the problem. Instead, it was the understanding, insight, and perseverance of Ms. Lamarr that made them work. Hedy invented as a hobby. Since she made two or three movies a year, each one taking about a month to shoot, she had spare time to fill in. She didn't drink and she didn't like to party, so she took up inventing....In Hollywood she set up an inventor's corner in the drawing room of her house, complete with a drafting table and lamp and all the necessary drafting tools....Spending evenings working at home working on an invention may sound surprising today, especially for a movie star, when so many other activities beckon through the Web. In 1938 the most common intellectually stimulating entertainment available at home were books, card and board games, and musical instruments. Hedy invented as a hobby. "Howard Hughes once lent her a pair of chemists," Forbes magazine reports, "to help her develop a bouillon-like cube which, when mixed with water, would create a soft drink similar to Coca-Cola. 'It was a flop,' she says with a laugh." Her daughter, Denise, remembers a tissue-box attachment Hedy invented for disposing of used tissue. Hedy invented to challenge and amuse herself and to bring order to a world she thought chaotic. As World War II approached she wanted to do more than just helping to sell war bonds (which he did very successfully). She wanted to put her knowledge to use. After the tragic sinking of the SS Benares by German Submarines and the death of 406 passengers (90 children) she joined up with composer-turned-inventor George Antheil. Hedy said that she did not feel very comfortable, sitting there in Hollywood and making lots of money when things were in such a state. She said that she knew a good deal about munitions and various secret weapons, some of which she had invented herself, and that she was thinking seriously of quitting MGM and going to Washington, DC to offer her services to the newly established Inventor's Council. 'They could just have me around,' she explained, 'and ask me questions.'" Her greatest breakthrough came as she and Antheil developed a remote-controlled torpedo that would be protected from jamming. There had long been a desire to improve the accuracy of torpedoes by letting a ship fire them and have a spotter plane, far off in the distance, manually guide them toward the target with radio waves. But given the current technology an opponent could just broadcast on the same signal and block the guidance. Hedy's idea was that the ship and spotter plane should "frequency hop"...this random change of radio signals would make it difficult to jam since the enemy would never know what signal to block. The key was to have the torpedo and spotter plane synchronize right before firing, and then change frequencies independently on a pre-determined basis. The basic components for such a system admittedly existed already. But nobody had ever put them together. Even back in the 1940s Philco had created a remote-control for radios that used varying frequencies to change the channel, adjust volume, and other things. Additionally, George Antheil had done much work on ways to synchronize player pianos so they would be completely in sync with each other. Combining these two in a tiny package was Hedy's job. Invention in hand Hedy now had two options for getting it adopted...receiving a US patent and selling the concept to the Navy. Sadly, at this time the Navy had two bigger problems than torpedo jamming; years of neglected research before Pearl Harbor left the Navy with torpedoes that ran too deep, missed their targets, and often failed to explode upon impact. They need to figure out the basics and were not yet ready for the complex solutions Hedy offered. So the Navy passed on Hedy's invention. Fortunately, in August, 1942 Hedy Lamarr and George Antheil received Patent Number 2,292,387 for their "Secret Communication System". At the same time Hedy Lamarr developed a few other inventions, such as an anti-aircraft shell fitted with a proximity fuse. But the greatest value lay in her initial work with frequency hopping. This technology allows communications between multiple people to be shared without interfering with one another. Although kept classified for many years, the military at least realized that potential and incorporated Hedy's ideas into many secret communications systems after the end of World War II. But it's biggest impact would be in the private sector. "[The discovery of frequency-hopping] enabled the development of Wi-Fi, Bluetooth, the majority of cordless phones sold in the US, and myriad other lesser-known niche products. The Global Positioning System (GPS) uses spread spectrum. So does the US military's $41 billion MILSATCOM satellite communications network. Wireless local area networks (wLANs) use spread spectrum, as do wireless cash registers, bar-code readers, restaurant menu pads, and home-controlled systems. So does Qualcomm's Omni-TRACS mobile information system for commercial trucking fleets. So do unmanned aerial vehicles (UAVs), electronic automotive subsystems, aerial and maritime mobile broadband, wireless access points, digital watermarking, and much more. A study done for Microsoft in 2009 estimated the minimum economic value of spread-spectrum Wi-Fi in homes and hospitals and RFID tags in clothing retail outlets in the U.s. as $16-$37 billion per year. These uses, the study notes, "only account for 15% of the total projected market for unlicensed [spectrum] chipsets in 2014, and therefore significantly underestimates the total value being generated in unlicensed usage over this time period." A market of which 15 percent is $25 billion would be a $166 billion market. "Hedy followed these developments. Sometimes she felt bitter about her lack of recognition as an electronic pioneer. In 1990, when she was seventy-five, she told a reporter for Forbes magazine how she felt. "I can't understand," she said, " why there's no acknowledgement when it's used all over the world." The reporter noted that she was "six times divorced and now living in Miami on a Screen Actors Guild pension" and couldn't help feeling she'd been wronged. "Never a letter," Hedy added, "never a thank you, never money. I don't know. I guess they just take and forget about a person." But that is not the end of the story. Late but not forgotten, US Army Colonel Dave Hughes started making the connections between Hedy Lamarr's accomplishments and our modern world. Thanks to his efforts in 1997 the Electronic Frontier awarded their sixth annual Pioneer Award to Hedy, then eighty-two years of age. In her most humble voice, she said "I hope you feel as good as well as I feel good about it, and it was not done in vain. Thank you." A few years later she was awarded the Viktor Kaplan Medal by the Austrian Association of Patent Holders. Since then the world has begun to better understand her role in our modern communications system, as well as learning that the Hollywood beauty shouldbe best known for her formidable brain. "Hedy's fondness for invention remained with her until the end," writes her biographer Ruth Barton. "She had a proposal for a new kind of traffic stoplight and some modifications to the design of the Concorde [the Anglo-French supersonic passenger airliner that flew from 1976-2003]. There were plans for a device to aid movement-impaired people to get in and out of the bath, a fluorescent dog collar, and a skin-tautening technique based on the principle of the accordion." Sadly Ms. Lamarr passed away in 2000. But her legacy lives on in our mobile phones, GPS maps, and Wi-Fi systems. And it lives in with our continued recognition of the works of citizen scientists, and the work of beautiful women with equally beautiful minds. One benefit to writing OpenScientist is getting to talk about citizen science with many impressive leaders in the field. They've been involved with the field for years but still find interest in talking to an amateur blogger posting from home every week. Not only is it flattering, but it was also a lot of fun to discuss citizen science and think about it from a variety of new perspectives. So when the good people at Socientize called wanting to discuss ways to advance citizen science in the European Union I jumped at the chance. One of the issues we discussed was whether Distributed Computing projects should be considered citizen science. Personally I believe it does and proceeded to provide a detailed (and hopefully not too rambling!) answer based thoughts I'd previously expressed in this blog (Is Distributed Computing Really Citizen Science?). But I realized there needs to be a better answer. Are you doing this as your main job or is it a hobby? Do you have advanced education in this field? Are you helping to our understanding of nature or technology? That's all there is to it. It certainly is not a technical definition and there are always problems with over-simplifying. But I think this could be useful. Looking again at the Distributed Computing question it seems pretty clear that it is Citizen Science. It is being done as a hobby, by people without advanced science education, which helps us understand nature and technology. It doesn't matter if there is low engagement or thoughtfulness after the project is downloaded and begun. There is still an everyday citizen performing science. This leads to the continuing question of how to best understand all the various activities falling under the concept of Citizen Science. Interestingly Socientize is working on this too. They have set up an "All Our Ideas" site at http://www.allourideas.org/citizen_science_definition to get everyone's input on the topic. As you may remember from my previous post about All Our Ideas, this tool allows users to vote on a series of questions to gauge the popularity of each answer against the others. It also let's people add their own suggestions and have others vote on those too. This provides researchers with both structured user data as well as free-form input. All important parts of any good citizen science project. Do the good people at Socientize a favor and take the survey. It will help them understand the field and find ways to improve it. It let's us have a say in the future of citizen science. And it let's you play with a fun new type of citizen science tool. So what are you waiting for...check it out!